You may now pre-order the Maxim 70 coin. We expect to be able to ship these out during the second week of November. They are $10.00 each, and should make excellent gifts. Award one to someone¹ whose persistence you admire, or to someone who needs a leg up over a recent failure. Or perhaps you might carry one in your own pocket as a tactile reminder of your own passion for standing back up after having been knocked down. Our first run of these is limited to 500. The Schlock Patreon supporters got a head-start, and we’re down to 250 as of this writing. We’ll order another 500 if it looks like we’re going to sell out, and if that happens this week we should take delivery of the second order in plenty of time to ship everything in time for Christmas. There’s no difference between the two runs, and we’re not numbering the coins. ¹The practice of awarding a coin to someone who has performed a service, or has otherwise acted in a notable manner, is about 75 years old. We’ve chronicled a bit of that in this free PDF: An Unofficial Anecdotal History of Challenge Coins, which was funded by our Kickstarter backers in 2013. We’ve been wanting to make some new challenge coins for a while now. Our hope is to have at least two designs done, die-struck, and delivered in time for Christmas. This is the first one. It’ll be simple struck brass, with an antique gold finish. No colors, no resin domes, just metal. I love all the coins we’ve made, but this design really speaks to me. I look forward to having this in my pocket, serving as a reminder that I’m allowed to make mistakes. The second coin we’ve planned is the Bristlecone ship coin, similar in design to the previous ship coins we’ve done. It’s not done yet, so no pictures. Watch this space. Pre-orders will open soon, perhaps as early as next week. The coins will be $10 each, plus shipping. Kickstarter backers got the first alert, which is only fair because they’re the ones who funded this two years ago. Our original delivery deadline was set for around six months after the Kickstarter closed. We only missed that by 18 months! Fortunately, the “how late are you?” clock can finally be stopped. 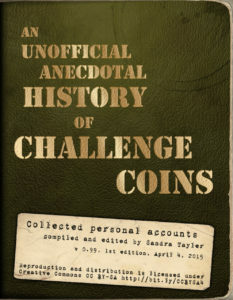 An Unofficial Anecdotal History of Challenge Coins is a free PDF full of challenge coin stories. It is not an authoritative attempt to codify the rules of coin challenges, nor is it a scholarly treatise creating an historical narrative. It is a collection of stories that are similar to the sorts of stories you might hear if a bunch of people were sitting around at the bar one night draining pints and talking about challenge coins. We’ve done our best to present these stories in a way that respects the various challenge coin traditions, and pays appropriate tribute to those who have served. If you would like to host this document yourself, you may! This document was released under the terms of Creative Commons CC BY-SA 4.0 International, which means that you are allowed to share the document freely, and you may remix, transform, and re-distribute the document provided you notify us, credit us in your document, and create a publicly accessible change-log. The life-cycle of this document is an open question. It is possible that we will be able to update and maintain it regularly (semi-annually?) incorporating new content from the widely varied challenge coin communities. It is also possible for us to hand the whole project, source files and all, to someone else for maintenance. For the time being, however, we, Sandra and I, own this, and will endeavor to correct anything that’s wrong with it. We do not yet have this in eBook format. We lack expertise with those file formats. Volunteers? See “Contact Information” below. There are no plans for a print edition, but the CC BY-SA license allows anyone to upload this to a Print-On-Demand service and create just that sort of thing. As of this writing the document is version 0.99. We expect a rash of edits (rash, red, get it?) to come in during the next few weeks, at which point the document will be updated to Version 1. The version number goes up by hundredths and tenths when small edits are made, and whole numbers when content is added. The edition number changes in whole numbers only, and only when new content is added. The cover and title page will be updated to reflect this. Our journey—Sandra’s and mine—with this document has been drawn out a bit further than anyone would have liked, and has induced exhilaration, guilt, anxiety attacks, and spurts of creative fury in various turns. At some point we may tell that story, but this page and this book are not the place for it. Please direct all inquiries to schlockmercenary@gmail.com, and include the unpronounceable acronym “UAHCC” in the subject line. We welcome submissions, hosting updates, suggested changes, and requests for source. This Is Not the One With an Elephant In It. Everything has been handed off to Sandra. An update will go out to Kickstarter supporters first, and then the PDF will go live, probably by Tuesday of next week. Yes, we’re delivering this about eighteen months later than we wanted it to, but we ARE delivering it. We’re sorry to have kept everyone waiting, and we look forward to sharing the stories that people have shared with us.